Thank you for joining us for the Showers and Flowers Challenge and we hope you will all join us again this week too. This week we are showcasing Newton’s Nook Products. You don’t have to use them for the challenge but if you have them we would love to see them used. On April 28th and 29th the awesome Simon’s Create Event is taking place. This event is so popular that it has sold out but the good news is that if you are anywhere in the area, there will be a pop-up store all weekend with create and takes too ! How fantastic is that ?! For further details please CLICK HERE ! 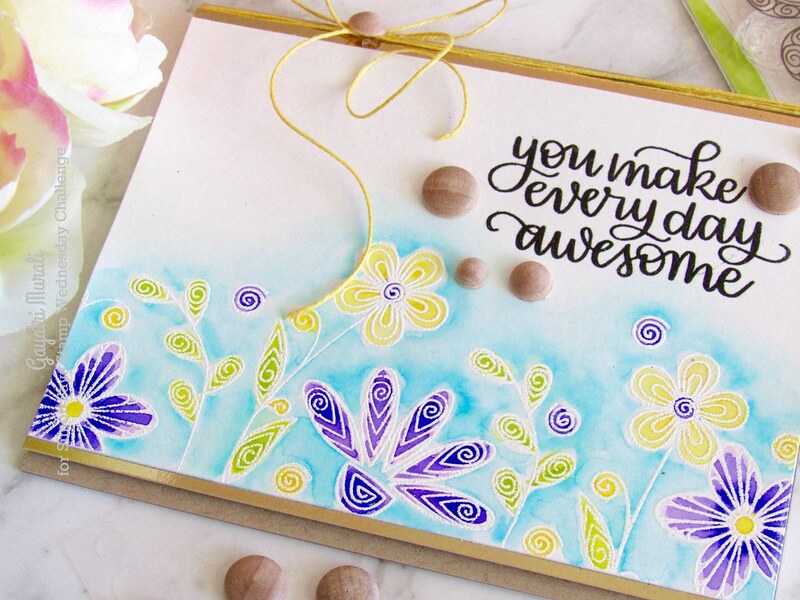 I have used Newton Nooks Beautiful Nooks stamp set to make my card. 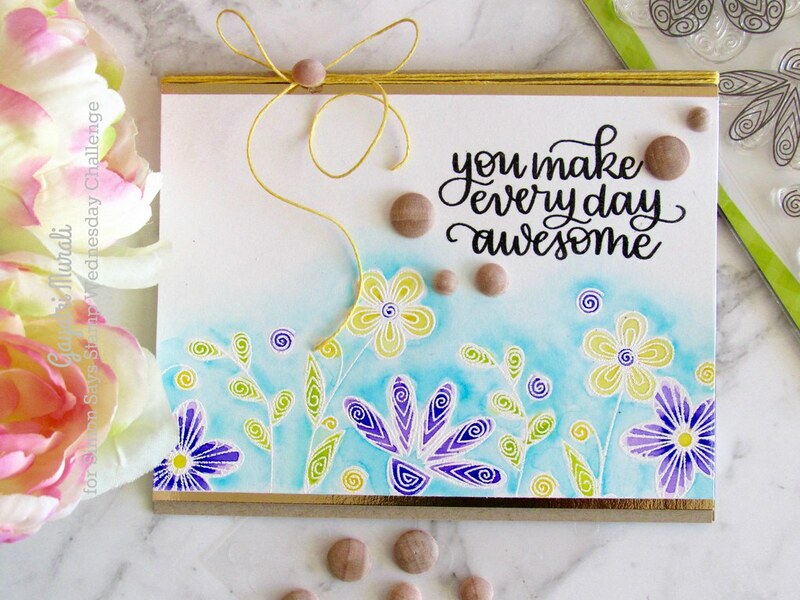 This is a quick and easy card with my favourite watercolouring technique. I white heat embossed the images on the bottom of the panel. Then used Zig clean brush pens to colour the images and the background. The paper I used is Bristol cardstock. I then stamped the sentiment from Simon Says Stamp Handlettered Encouragement stamp set and heat embossed the image using clear embossing powder. I then trimmed the panel, added a strip of gold mirror cardstock and adhered on a Kraft card base using foam adhesives. To finish the card, I added yellow twine and woodgrain enamel dots. Love the sentiment. I think it will make anyone happy to receive a card with this sentiment. The doodle images are beautiful. Here are couple of closeups of the card. Such a lovely fresh design, Gayatri, perfect for spring! You always make such beautiful cards. So pretty. This card is simply gorgeous! 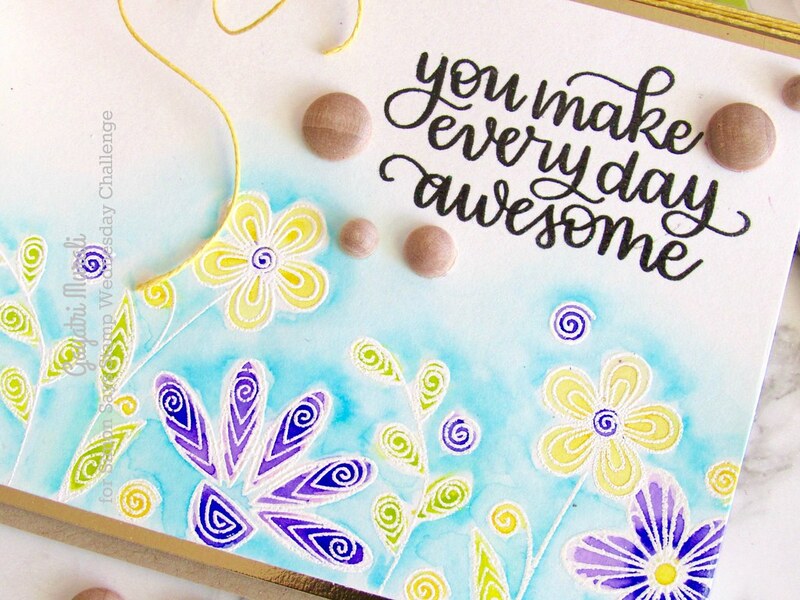 I love the colors you used and the composition of the card! The woodgrain enamel dots are also very cool! Thanks for featuring our images on the Simon Says Stamp Wednesday Challenge! Thank you so much for your lovely comment Jen!